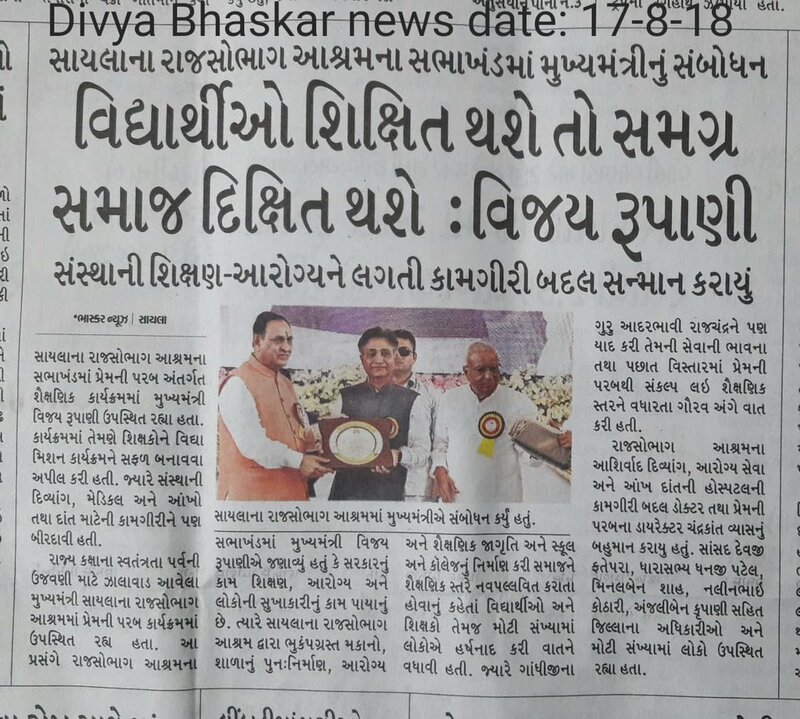 The Honourable Chief Minister of Gujarat, Shri Vijaybhai Rupani visited Shree Raj Saubhag Ashram on 15th August, India’s 72nd Independence Day. The purpose of the visit was to witness the Ashram’s achievements in the fields of education, social welfare, medical and ophthalmic services which are provided to the local community; as well as to honour and motivate the staff members who provide these services. Due to the quality of equipment used, the commitment of doctors and educationists, complete dedication of care givers and the services provided, these institutions have often been described as ‘centres of excellence’ and ‘unique, especially in India’. The Chief Minister and first lady were warmly welcomed by the spiritual head of Shree Raj Saubhag Ashram, Param Pujya Bhaishree (Shri Nalinbhai Kothari), along with Brahmanishts Minalben and Vikrambhai on the steps of Raj Mandir (the new hall which is nearing completion). The column-less, brilliantly lit auditorium with its intricately carved marble and stonework has seating capacity for almost 2000 people, is an architectural masterpiece, which resonates divinity. Raj Saubhag Ashram follows the teachings of Bhagwan Mahavir as explained by Shrimad Rajchandra. Outside the Jain community, Shrimad Rajchandra is better known as the spiritual guide and mentor of Mahatma Gandhi. Disciples of Raj Saubhag Ashram living in India and abroad spend days, weeks and even months in its hallowed premises pursuing their spiritual growth. 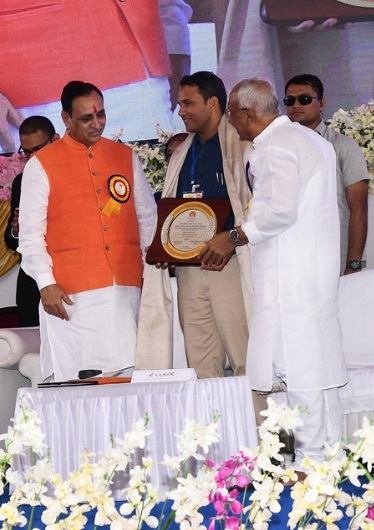 Smt Minalben formally welcomed the Honourable Chief Minister and other invited dignitaries, as Pujya Bhaishree presented him with a crystal engraving of Shrimad Rajchandra as a momento. 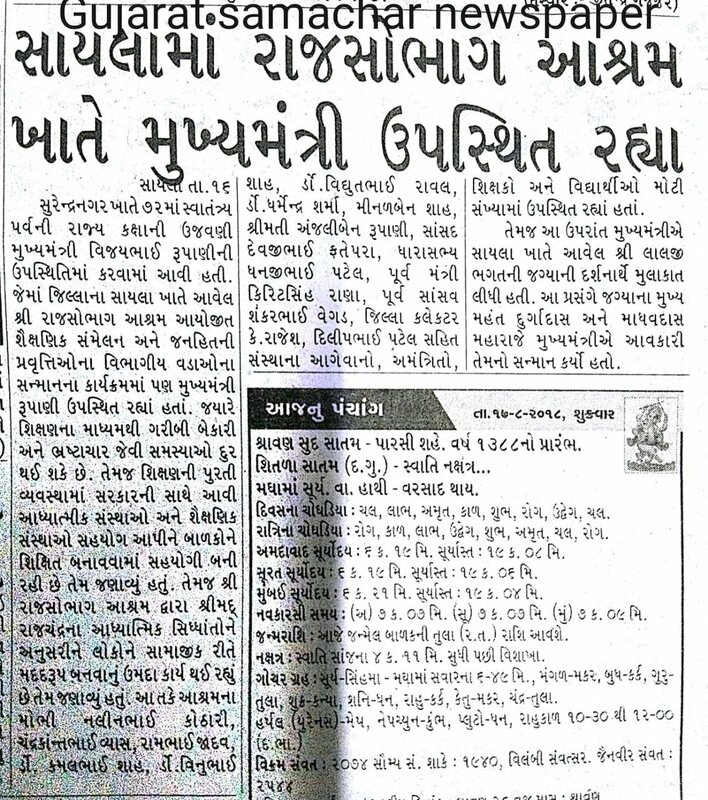 Compering the event, Minalben and Vikrambhai described the various humanitarian activities undertaken by the Ashram, and introduced the people in charge. Each head was called on the dais and honoured. Pujya Bhaishree then delivered his address. First, he expressed his extreme pleasure with the visit by the Chief Minister on the country’s Independence Day. He went on to explain that the Ashram was located at Sayla primarily because it was the hometown of Shrimad’s soulmate, Saubhagbhai and that the founder of the ashram, Late Shri Ladakchand Manekchand Vora (Param Pujya Bapuji) was also from Sayla. Pujya Bapuji firmly believed that one should always give back to society and that spirituality cannot flourish in the absence of compassion. Inspiring kindness in the hearts of disciples who came to the ashram, welfare activities in the region bloomed. Starting from a small scale, the humanitarian projects have grown exponentially, with women’s education getting a tremendous boost. Until some years ago, Sayla taluka was regarded as having an extremely low female literacy rate, now has over 1000 girls attending Raj Saubhag High School. 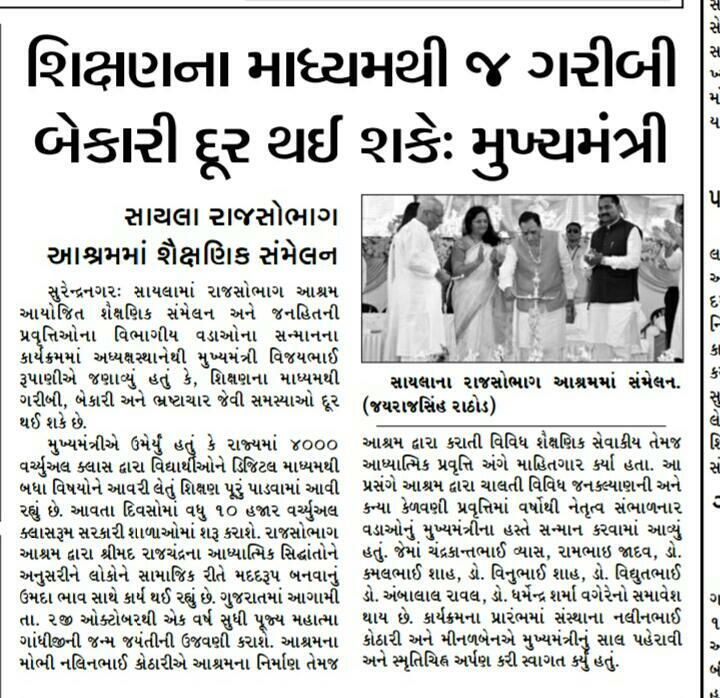 Similarly medical and social welfare has grown tremendously, said Pujya Bhaishree while thanking the Chief Minister once again for his visit. Responding with equal warmth, the Chief Minister said that it was his earnest desire to visit the ashram since he had heard so much about it. He conveyed greetings of the national Independence Day and spoke about a number of patriotic Indians right from 1857 to 1947, who had advanced the cause of India’s independence. He singled out Mahatma Gandhi for his courage, perseverance and above all, his moral ethics including ahimsa and aparigrah (living with less). These characteristics were inspired in Gandhiji by Shrimad Rajchandra. 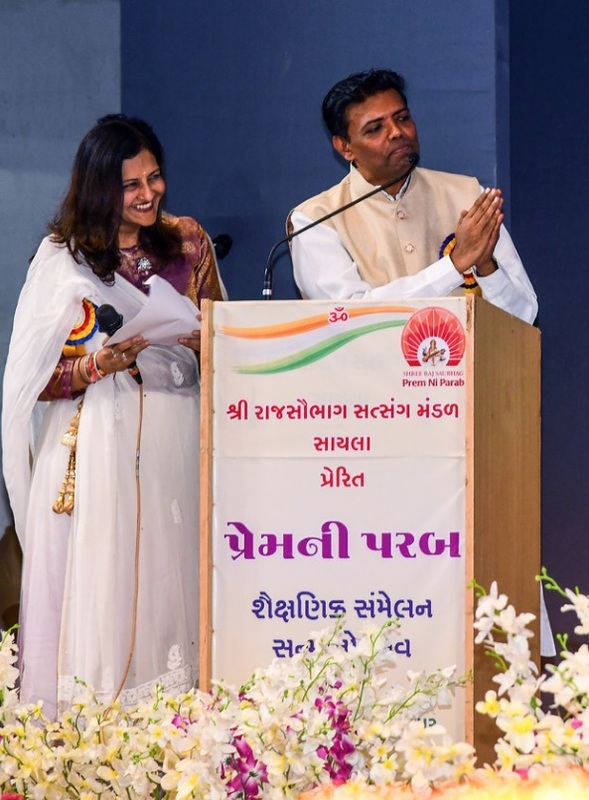 He also spoke about Jain philosophy and illusory happiness, while giving an indication that there would be a 150th anniversary celebration for Mahatma Gandhi in a similar style to that of Shrimad Rajchandra. 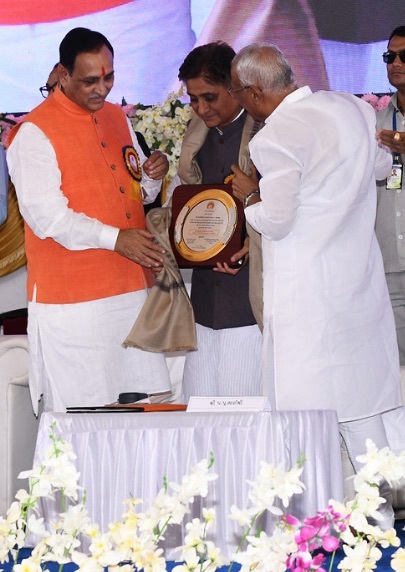 The Chief Minister sincerely congratulated Raj Saubhag Ashram for its selfless service to the poor in the region, adding that in reality this was the duty of the government. He added that the state government has been increasing its allocation for welfare activities, especially in the field of education and gave details about his government’s current education project ‘Mission Vidhya’, while highlighting the major contribution being made by the teachers in developing the education. 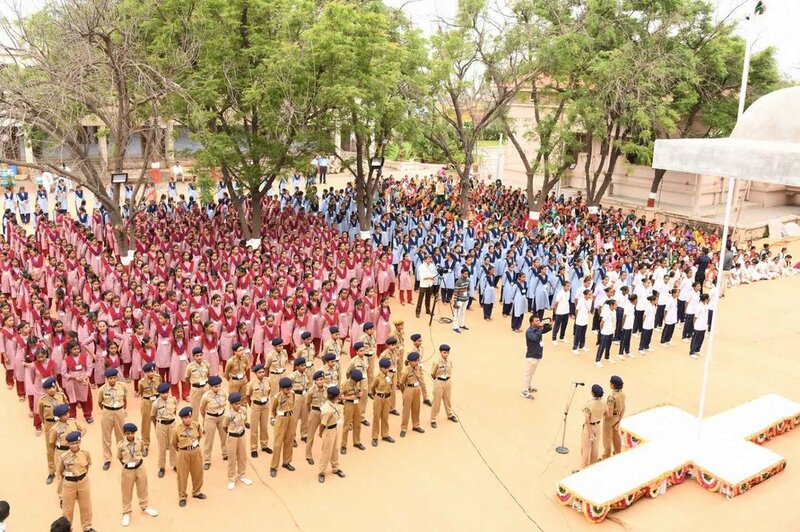 The auditorium was live with the cheerful voices of over one thousand girls from Raj Saubhag School and college and over 900 teachers from schools in Sayla taluka. Leading members from various communities in Sayla were also present.